Alyssa Bernal is a 21 year old Texan who has just released her debut album, Love Hangover and it's poptastic! Her first single Soaking Up The Sun was released in September, but her follow-up single Cali, Cali, Cali - a tribute to California of course, is the one that should really get her noticed. Alyssa released some acoustic songs on YouTube which caught the attention of superstar Pharrell Williams who signed Alyssa and helped with the production of her debut album - and it's a treat! Alyssa's vocals are sugary sweet and the summer vibe of this song is strengthened by the beautiful Jason Mraz style guitar work. Check out this weeks Pop Pick Cali, Cali, Cali below! The last time we brought you news about DJ Fresh it was in Pete's Pop Picks back in July with his single Louder featuring Sian Evans. Louder became a big hit in clubs world wide and raised DJ Fresh's profile into mainstream. He's back to do it again with his new single Hot Right Now featuring Rita Ora a blonde beauty from Kosovo and upcoming dance act recently signed by label Roc Nation. This track builds on the success of Fresh with less of a club feel and more pop centric. Check out the video and single Hot Right Now here! 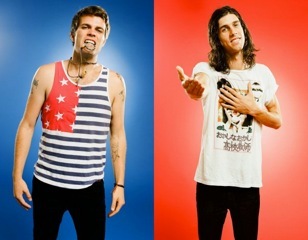 Believe it or not, 3OH!3 have actually been on the music scene for over 7 years and it has been 4 years since they had their first big hit Don't Trust Me! They're back now with their new single Bang Bang and it sets to repeat their repetitive pop formula that's been good to these handsome boys from Colorado. They have a new album which is due to be released in 2012 but in the meantime they've released 3 new songs, led by Bang Bang. It's another fun song from the guys - have a listen yourself!